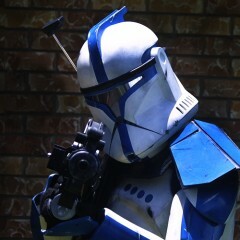 Advanced Recon Commandos, also known as Advanced Recon Clone troopers or simply ARC troopers—were an elite variant of clone trooper in the Grand Army of the Republic during the Clone Wars. 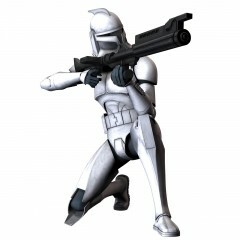 Although less numerous than the other clones, they were also among the most skilled soldiers in the galaxy. 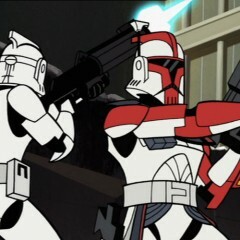 Clone troopers were an army of identical, genetically-modified clones, created to serve in the Grand Army of the Republic during the full-scale intergalactic conflict that came to be known as the Clone Wars. 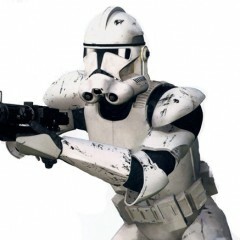 Grown at an accelerated rate and raised in the laboratories and facilities of Kamino, the clone troopers were trained throughout the first ten years of their lives to become one of the most efficient military forces in galactic history. 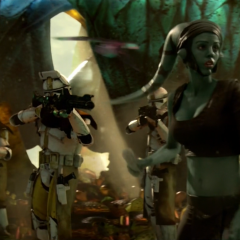 Bred for the sole purpose of combat, the clones were indoctrinated with unwavering obedience to the Galactic Republic and—more specifically—their Commander-in-Chief, the Supreme Chancellor. 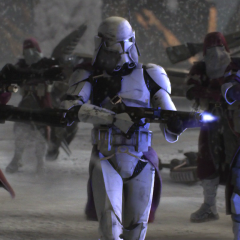 The troops of the 327th Star Corps were distinguished by striped yellow markings running the length of their armor and, as a result of Clone Marshal Commander Bly’s ARC training, his troopers were allowed to don kamas and command pauldrons. One unit within the 327th was K Company.